Even today, Darjeeling tea is processed using the orthodox method of manufacturing and not by following the standard CTC (Curling, Tearing & Crushing) method which is typically followed in the plains. The process follows several delicate and intricate steps. Depending on the type of tea to be produced, all or few of such steps are followed. Darjeeling Black Tea goes through all the stages discussed below. Few gardens in Darjeeling today have started growing tea bushes using organic method. The organic method follows natural way of growing tea keeping complete ecological balance and not using any chemical pesticides or fertilizers. In order to develop ecological balance, the estates need to preserve forest and other natural areas apart from just the land under tea. This is the first step and an art by itself. For Darjeeling tea, there needs to be only selective plucking of two leaves and the bud that makes a shoot. And one needs some 22,000 shoots to make one kilogram of tea leaves. On an average a plucker is given a target of 4 to 5kgs per day, and during the high plucking season the target increases and can get doubled. The target must be met to get full daily wage. So you can imagine the amount of hard work that goes in. is explaining how Darjeeling tea is plucked. The problem of plucking is compounded with the cold and damp weather along with difficult hilly terrain on which the tea is grown. While tea plucking season is from March to November, bulk of the tea leaves are plucked during the monsoon time. However over the years the garden workers in Darjeeling have acquired such skills and efficiency that they can pluck the tea leaves with their gentle fingers at ease and like a machine. Mostly the teas are plucked in the morning when the morning dews are still there on the tea leaves. Tea plucking at gardens of Darjeeling are done mostly by Nepali women. Over the years they have acquired the skills and are considered more efficient and consistent than the men. A handmade basket locally known as 'Doko' is tied to the back and is used to store the plucked leaves. Once full, the women bring the baskets full of tea leaves to the factory. The next step is withering which is a way of drying the tea leaves in the factory. It is essentially removing the moisture content of the leaves. Initially the tea leaves have 70 - 80% moisture. The leaves are placed in a trough (long wooden box) that are usually 70 to 80-foot long, 5-6 feet wide and 3-4 feet in depth. The box is covered with a wire mesh. Strong air is blown through the boxes with the help of large axial fans placed at one end. This helps drying the tea leaves uniformly. The withering usually takes place for 14 to 16 hours, and about 65-70% of the total moisture content gets removed through this process. After withering is completed, the tea leaves are taken to the next stage of rolling. Here mechanical rollers twist and press the leaves. The idea is to take any left over juice and moisture out of the leaves and then flatten the leaves. Usually the tea leaves are subjected to two rolling of 40 minutes each and the rolling pressure varies. In between the rolling, sifting takes place where the coarse leaves are separated from the finer leaves with the help of machines. The step is carefully monitored so that leaves do not break and overheating does not take place. The third step is to ferment the leaves. In this stage, the leaves are kept on thin and clean trays in a cool and humid environment. Through bio-chemical process the fermentation takes place. Usually the process lasts between 2-4 hours depending on the quality of tea being produced. It is at this stage when the tea leaves actually start developing their natural aroma and flavor. Any over or under treatment here can completely spoil the quality of tea. Expertise and experience comes into play in full swing while this stage is carried out. 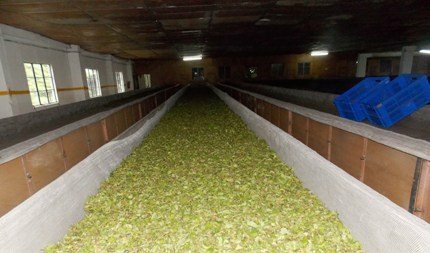 After fermentation, the tea leaves are once again dried in large mechanical dryers. They are fed in through conveyor belts from one end. The belts continuously vibrate and then take the tea through a temperature range of 115-120°C and bring out ready tea from the other end. The process lasts for about 20-30 minutes. At the end the tea is almost completely moisture free. The final stage is to sort or separate the different grades of tea leaves based on their size and then pack them. 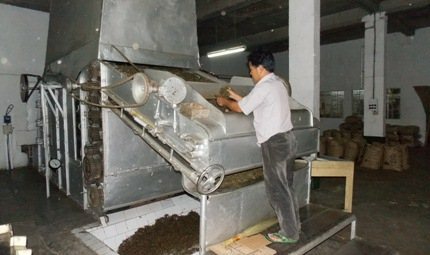 There are automatic sorting machines that sort the tea leaves based on their sizes (full leaves, broken, fanning and dust). 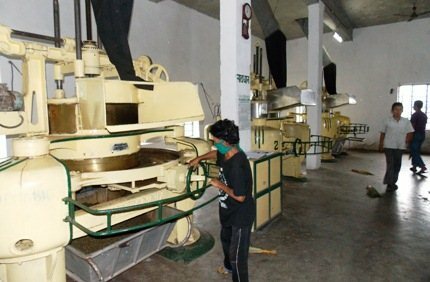 Note that all types of tea do not go through the same processing steps. In fact depending on the flavor and quality of tea, within each step delicate variations are made. The Black Darjeeling Tea usually goes through all the steps that I have mentioned above. In case of Darjeeling Green tea, the leaves are first withered. The withering takes place between 8 to 24 hours to remove the moisture. After that they are steamed, as a result the oxidation is prevented to take place and the enzymes are neutralized. Then the leaves are rolled to different degrees and again dried. Due to lack of oxidation, the leaves retain the green color, as well as the antioxidants and polyphenols that are great for health. 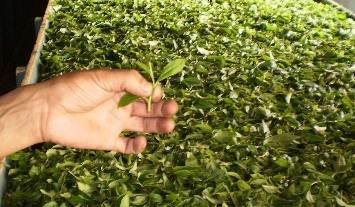 Processing of White tea is somewhat similar to that of green tea. White tea is only steamed and then dried. There is no withering, rolling or oxidation done keeping all the natural ingredients and the chemicals almost intact.